FDA’s webpage also fails to mention that the perchlorate Reference Dose (RfD), the amount of exposure unlikely to result in an adverse health effect, was set more than a decade ago and does not reflect the latest research. In 2013, the Environmental Protection Agency (EPA)’s Science Advisory Board indicated that the RfD may not sufficiently protect pregnant women and young children. As a result, EPA, with FDA’s support, is in the final stages of updating that number. FDA’s estimated average exposures to perchlorate by infants and toddlers was very close to the RfD, and many children may well exceed the outdated RfD. In the 2016 update, we noticed that some foods, such as bologna, salami and rice cereal, had very high levels, far greater than in 2004-2006. 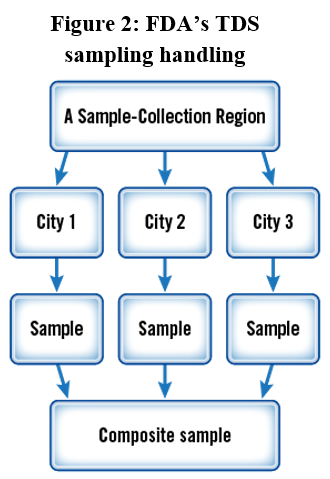 In May 2017, FDA provided more data that enabled us to learn what region and year the samples were collected. Any follow-up testing or investigations. FDA’s response to the FOIA raises concerns. First, the agency did not have criteria for following up on perchlorate. Specifically, staff requested guidance “on cut-off value of perchlorate in the composite that would trigger analysis of individual foods,” but we didn’t find any in the documents provided to us. Without this guidance, some staff listed composite samples with at least 20 ppb as “noteworthy;” others used 15 ppb as the trigger for re-testing and confirmation. All 47 samples we asked FDA about were above these levels. Yet, there was no retesting of the composite for 27 of them. Second, staff confirmed the results for 20 composite samples which should have triggered tests on the three individual samples that made up the composite. omposite in summer of 2008): Newark sample had 252 ppb; New York City had 112 ppb; and Philadelphia had 3 ppb. Baby food carrots (74 ppb in composite in winter of 2011): Denver sample had 163 ppb; Los Angeles sample had 111 ppb; and Seattle sample had 0 ppb. Baby food barley cereal (67 ppb in composite in spring of 2008): Dallas had 182 ppb; and Tampa and Baltimore had 1 ppb. Baby food oatmeal with fruit (42 ppb in composite in summer of 2008): New York City had 82 ppb; Newark had 3 ppb; and Philadelphia had 0 ppb. Even more disturbing is that, despite confirming the results in the composite samples, FDA could find no records that the individual samples in the highest levels, bologna with 1557 ppb, 1,090 and 686 ppb for collard greens and 686 ppb for salami lunchmeat, were ever tested. Similarly, the agency could not find any records of the TDS coordinator investigating the possible cause of the high levels of contamination or any communication between the coordinator and others in the Center for Food Science and Applied Nutrition that oversees the TDS. Also not available were the receipts essential to identifying the brand and lot of the samples with unusual high levels of perchlorate; therefore EDF was unable to follow-up. The agency’s apparent lack of follow-up when faced with jaw-dropping levels of a toxic chemical in food is disturbing. While testing the products is a critical first step, FDA needs to investigate the reasons for the high levels so that it can protect the food supply. 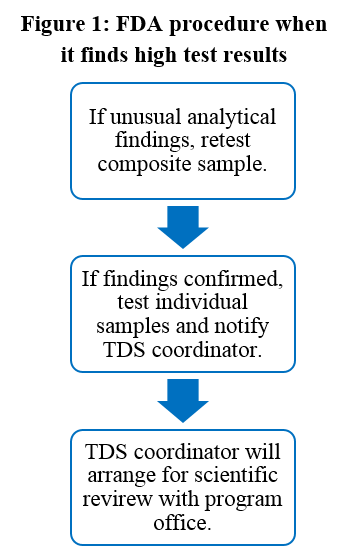 Identifying the cause and crafting interventions to reduce or minimize risks, as stated in the TDS purpose statement, is especially important for toxics like perchlorate, where even short exposures during critical life stages may cause lasting harm to a child’s developing brain. But for this to happen, FDA needs to acknowledge the evidence on sources of perchlorate in food, such as its use in packaging or from degraded bleach, and clearly explain what the implications are for the health of children and pregnant women, especially those with low iodine intake. Update on related perchlorate issue: FDA has not yet responded to EDF’s and eight other public interest organizations’ objection to the agency’s May 4, 2017 decision to reject a petition to ban perchlorate from uses in contact with food. The objection and request for evidentiary hearing were filed on June 4, 2017. This entry was posted in FDA, Food, Health Policy, Health Science, perchlorate, Public Health and tagged Baltimore, Barley, bologna, Carrots, Children, Collard Greens, Dallas, Denver, FDA, Los Angeles, Neurotoxin, Newark, NYC, Oatmeal, perchlorate, Philadelphia, Rice, salami, Seattle, TDS, total diet study. Bookmark the permalink. Both comments and trackbacks are currently closed. How do the perchlorates get into our food? Is it from a specific pesticide? Is it from pollution in the air? Please advise.